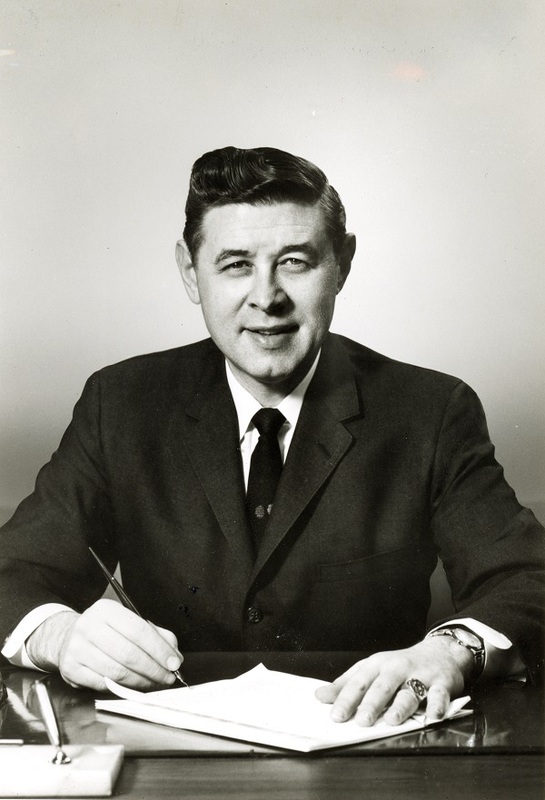 Henry W. Maier (1918-1994), Milwaukee’s longest serving mayor, led the city from 1960 to 1988. Born Henry Walter Nelke in Dayton, Ohio, Maier was raised by his maternal grandparents and moved to Milwaukee to join his mother and her second husband Charles Maier after high school. Taking his stepfather’s last name, Maier attended the University of Wisconsin-Madison, graduating in 1940. That same year he made his initial foray into politics, supporting Republican Wendell Wilkie’s presidential campaign. After serving in the Pacific during World War Two, Maier worked briefly as an insurance agent in Milwaukee. He returned to politics as a Democrat in the late 1940s. Maier lost his first mayoral bid in 1948, finishing sixth, but won a state senate seat two years later. He remained in Madison for a decade, serving as his party’s floor leader while making an unsuccessful run for the U.S. Senate in 1956. Maier was elected Mayor of Milwaukee in 1960, winning 58% of the popular vote. A “technocrat” with a talent for municipal government, Mayor Maier reorganized city departments to enhance efficiency, most especially combining the planning, housing, and redevelopment offices into the Department of City Development. Maier’s book, Challenge to the Cities (1966), was a how-to for urban leaders that demonstrated his belief in practical budgeting and prioritization. He served as president of the National League of Cities (1964-1965) and the U.S. Conference of Mayors (1971-1972). Maier was adept at bringing state and federal dollars to Milwaukee, taking advantage of urban aid programs during the 1960s. Despite his vocal commitment to urban development, Maier has been criticized for his handling of racial issues. When race riots broke out in 1967, the mayor declared a state of emergency, imposed a curfew, and called in the National Guard. Although many residents applauded Maier’s decisiveness (he was re-elected in 1968 by the largest margin in Milwaukee history), the mayor came under fire from civil rights activists. He opposed citywide open housing legislation and his “39 Points” proposal to address racial inequality was widely panned as impractical. Maier insisted that resolving racial problems required state and federal, rather than municipal, reform. Maier’s career was marked by a long-running feud with the news media, which he believed “kept the pot boiling.” His relationship with the Milwaukee Journal was particularly contentious. A “bombastic” politician, he displayed a flair for showmanship throughout his career. Maier was one in a line of singing mayors in Milwaukee history and often incorporated marching bands and music into the ceremonial duties of his office. He frequently lent his voice to civic celebrations and even penned the lyrics to the Summerfest Polka in 1969. Known as the “Father of Summerfest,” Maier tirelessly championed the idea of a large lakefront festival that came to fruition in 1968. Throughout his twenty-eight year tenure as mayor, Maier’s administration remained dedicated to promoting festival culture, tourism, and downtown revitalization. ^ Richard M. Bernhard, Snowbelt Cities: Metropolitan Politics in the Northeast since World War II (Bloomington, IN: Indiana University Press, 1990), 175; John Gurda, The Making of Milwaukee (Milwaukee: Milwaukee County Historical Society, 1999), 352-353. ^ Henry W. Maier, Challenge to the Cities; an Approach to a Theory of Urban Leadership (New York, NY: Random House, 1966). ^ Gurda, Making of Milwaukee, 353-354, 425. ^ Bernhard, Snowbelt Cities, 181-182; William F. Thompson, The History of Wisconsin, vol. VI: Continuity and Change, 1940-1965 (Madison, WI: The State Historical Society of Wisconsin, 1988), 389-394; Gurda, 365-374. ^ Henry W. Maier, The Mayor Who Made Milwaukee Famous: An Autobiography (Lanham, MD: Madison Books, 1993), 90, 171. ^ Gurda, Making of Milwaukee, 353, 401-402; Bernard, Snowbelt Cities, 184. Maier, Henry W. The Mayor Who Made Milwaukee Famous: An Autobiography. Lanham, MD: Madison Books, 1993. Thompson, William F. The History of Wisconsin. Vol. VI, Continuity and Change, 1940-1965. Madison: State Historical Society of Wisconsin, 1988.